Ham and bean soup is a dish with which many of us are very familiar. It is a warming and very satisfying winter meal. My recipe has rivvels, a twist from Pennsylvania Dutch tradition, and it turns on flavors that I enjoy. I think you will, too. In our home it is a special occasion to bake a country ham. A baked country ham only comes a few times a year, but it is always a favorite. Whenever I cook a country ham there is always a ham hock, removed to fit the ham in a smaller pot for soaking prior to cooking, and then there is the bone of the ham left after slices of ham have been removed. I have learned to leave some meat on our holiday ham bones to allow the bone and meat to be turned into a variety of delicious dishes that extend the ham’s enjoyment past when the ham slices have all been devoured. Ham stock to flavor pots of beans in the summer, country ham rillettes to spread on biscuits with whole grain mustard, and pressure canned ham-infused beans are a few of the things I like to do with ham bones and hocks. 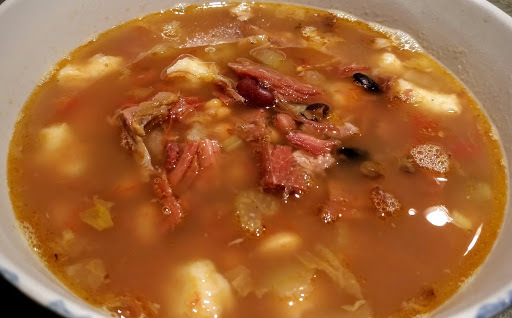 Of course, my favorite thing to do with leftover ham bones and hocks is to make this ham and bean soup. My first key to ham and bean soup is to use a variety of dried beans. You may soak your beans overnight, but I find that the result is best to skip the soaking. 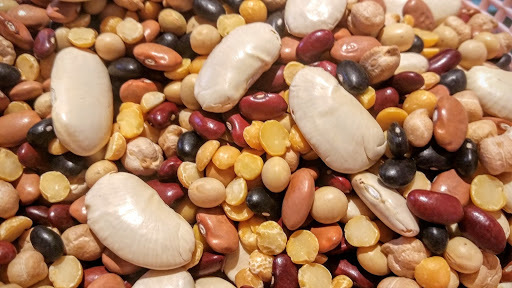 A variety of beans makes the soup visually appealing with all of the brilliant colors, it adds flavor as each bean contributes its character to the dish, and it adds texture with each type of bean having a different mouth feel. I am a sucker for buying dried beans when I see them in the store. I always have a variety on hand. This is a balance, however, since dried beans do have a shelf life and quality will degrade if they are not used within a couple months. That is not a problem here, as we cook a lot of beans in our home. For today’s soup I used about five cups of dried beans. My batch of soup is about 10 quarts, so think of about one cup of beans for every two quarts of finished soup, give or take. I started with two kinds of small Central American beans. One is black and the other is deep red. These beans have a great flavor and their small size makes them perfect for soup. Next, I had some pink chili beans that I won as a prize in a chili cook-off. These beans have a unique flavor and some will soften and break down to add body to the soup broth. I used some dried soy beans that I have on hand for making a hearty German style bread, and some yellow split peas that I bought to make some pea meal bacon (coming soon). I added some garbanzo beans, since we always have them on hand for making hummus. Last, but not least, is a bean I consider to be essential to this dish: big dried lima beans. You don’t need a lot of these lima beans, but they will soak up the ham broth and become nuggets of delight in the finished soup. I know that lima beans often bring out a lot of emotion in some people, but trust me, you want them. Wash the beans in a colander and sift through them to sort out any small pebbles. No one wants to bite down on a rock in their soup. I almost always find one or two pebbles in the beans. Now it is time to start the pot. I use a large pot, about 16 quarts, so there is plenty of room. 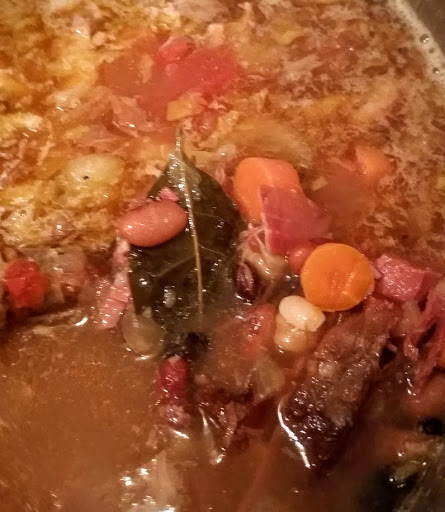 Place the meaty ham bone and hock in the pot. Cover with cool water. This will be about half of the pot; no need to measure. Toss in the cleaned dried beans. Add ½ teaspoon of black peppercorns, 4 bay leaves, one coarsely chopped onion, and five or so smashed cloves of garlic. Bring the pot to a boil over medium heat, then reduce heat to low and cover the pot. Simmer the pot until the beans are tender. This usually takes two or three hours. Taste several of the beans to make sure they are cooked. It is OK if they are still al dente because there is more cooking to go. Remove the ham from the pot and allow to cool enough to handle. I use the lid of the pot for this purpose. Pull the ham from the bones and roughly dice in bite sized pieces. Remove any fat or connective tissue. You want about four cups of nice ham meat; some will be tiny bits and some will be tasty cubes. Put the ham back in the pot and continue to simmer. Next, add vegetables to the pot. Here you can follow your preference. I cut the vegetables in about ½ inch pieces. Today, I added two cups of chopped carrots, two cups chopped celery (stalks and leaves), another onion, about 10 cloves of roasted garlic, five more smashed cloves of fresh garlic (love garlic), and half of a small head of Napa cabbage. Other options include potatoes (I like to add them unpeeled), turnips, parsnips, kale, etc. Note that if you plan to freeze some of the soup, potatoes do not hold their texture after freezing. The last vegetable item to be added to the pot is a quart of home canned plum tomatoes. Add them whole with their juice. You may add a can of good quality canned tomatoes. Bring the pot back to a low boil, and then reduce to a simmer again. Simmer uncovered until all of the vegetables are cooked. Now for the Pennsylvania Dutch twist. I make a noodle or dumpling that we call rivvels. These are optional, but we love them in soup. To make the rivvels, put 1-1/2 cups of all-purpose flour in a bowl. Make a well in the flour, just like making pasta, because that is what we are doing here. In the well, place ½ teaspoon salt, 1 teaspoon olive oil, 2 tablespoons of milk, and two eggs. Stir the wet ingredients in the well with a fork to gradually mix in the flour. 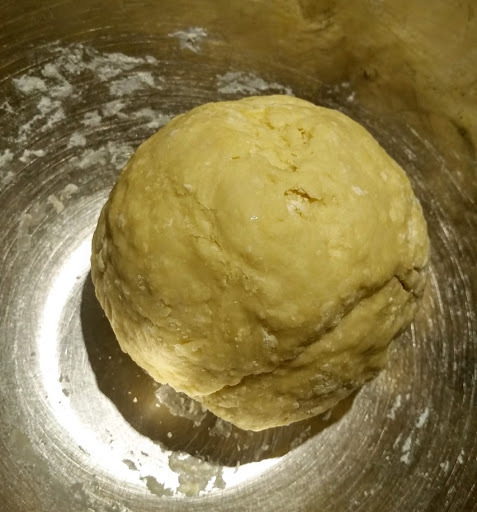 When it is all mixed, knead the dough in the bowl with your hand. The dough should be firm and not sticky. Knead until it is smooth and springy. Wrap the ball of dough in plastic and set aside for 15 minutes to rest. Raise the temperature of the pot back to a low boil. Pinch tiny bits of the dough from the ball and toss them into the lightly boiling soup. Make sure the bits are tiny because the rivvels will puff up in cooking, and larger rivvels tend to be chewy. 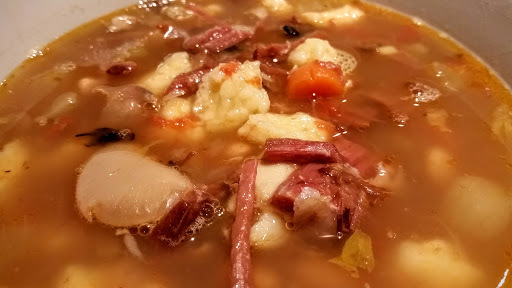 You want the rivvels to be tiny, fluffy, random dumplings that soak up the luscious ham broth and add one more unique flavor/texture element to the finished soup. Rivvels cook in about 2-3 minutes. Reduce the stove back to low or simmer setting, and the soup is ready to serve. I like to serve this soup with some habanero based hot sauce. Habanero hot sauce with a curry element is particularly good, I think. 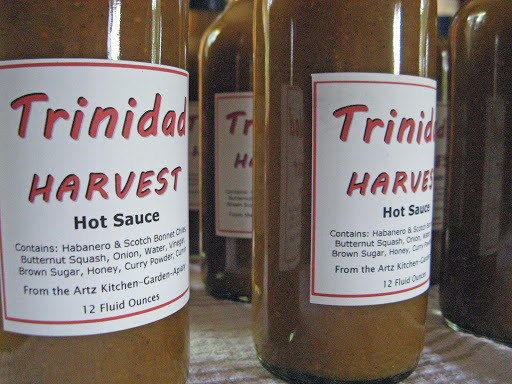 Of course, many folks like it as it is, and that one of the beauties of hot sauce. Everyone can suit their own taste. Prev Pork and Sauerkraut "Viel Glück im neuen Jahr!"